single bar & room. Good beer. Bizarre walk to the toilets through what appears to be a disused hotel! Weird Polish barmaid behind the bar don't take her seat at the bar otherwise the bouncers from across the road will sling you out. Strange people attend this place don't go unless you have a giro book or look like a 6 fingered freak. Apologies to the guy with the beard and the baseball cap with a pungent smell of body odour, if you would of put your name on the seats that us day goers were sitting in we would of kindly moved. Maybe next time don't mutter it and speak out its a free world now you know. A quick suggestion would be to make a reserved card and a nice candle and place it on the table. This is still a great pub by the way and has a good selection of beers with most beers priced at �2.20 which is great value for money.Barmaid was friendly and majority of pundits were so dont let being a day goers put you off. I liked this pub. Friendly barmaid and a well-kept pint of a Moorhouses beer called Barristers Brief (presumably done specially for the pub) for �1.80. 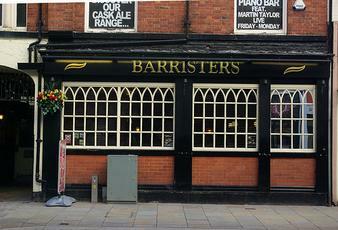 This would be my pick of the pubs I tried in Bolton.